cardigans and kids: summer treats - popsicles!! Kansas is blazing hot right now. You don't even get all the way out of the door before you start to sweat. 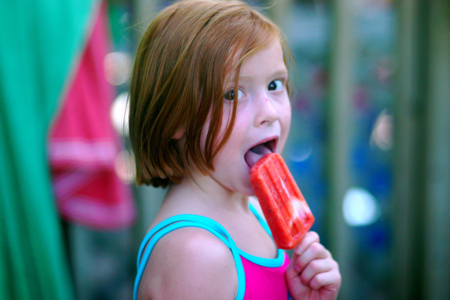 Perfect time for popsicles. Not only do they taste good but you don't have to warm up the house a bit to make this sweet treat. Pour the fruit puree into popsicle molds, filling only half full, add the yogurt and then finish filling with the puree. After the lid is on top of the molds, and the popsicle sticks. Freeze for at least 4 hours. To take out of the mold, let thaw a couple of minutes or run water over the molds to loosen.